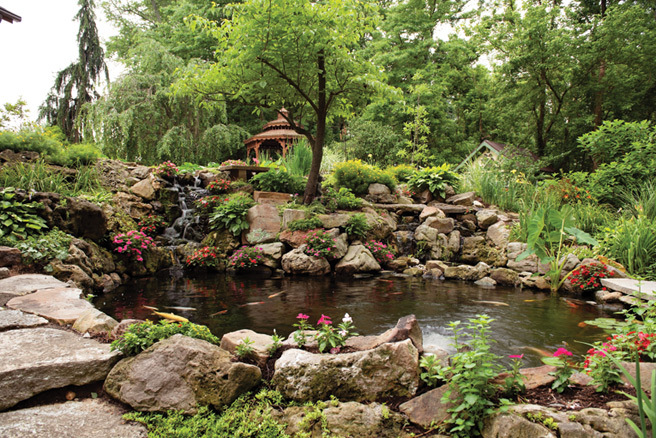 Florissant garden is a treat for both eyes and ears. Sticklers for the English language would argue that gardens couldn’t compose music or sing. But then they wouldn’t have been to Ginny Mueller’s garden. It harmonizes with the land via streams that spill down the hillside with boundless joy and hums quietly in pools filled with colorful koi. It trills to the tune of a landscape interspersed with five fountains. 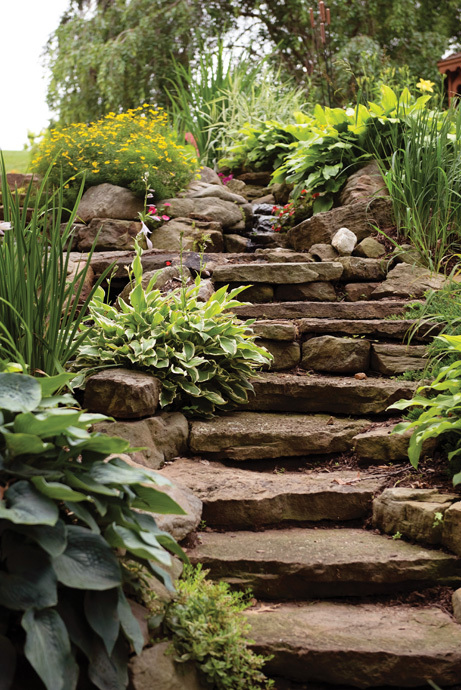 There are crescendos in the stone steps that climb the hillside and staccato notes in the sharp boulders that give the garden its definition. 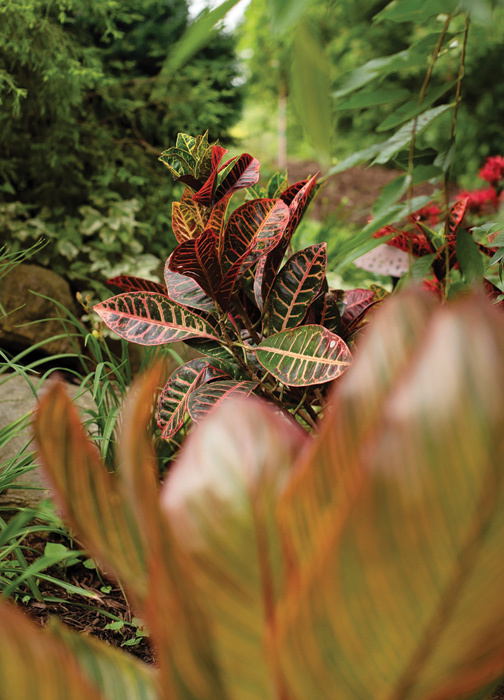 A rhapsody of vibrant color swirls from the garden beds to the outdoor living spaces. 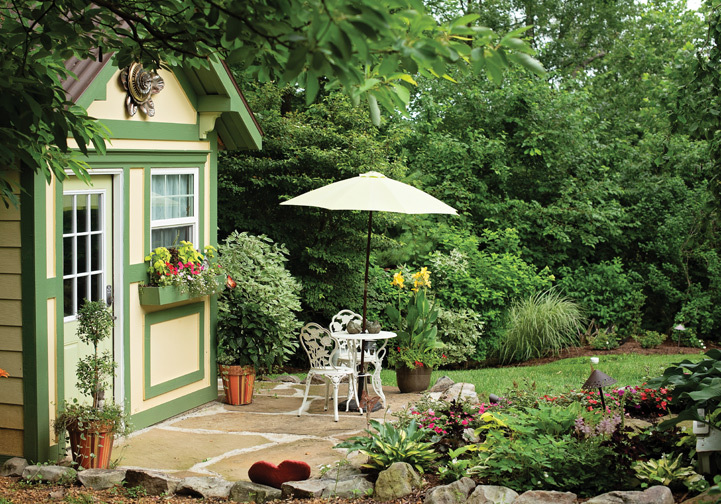 Whimsical ditties seem to hover around the charming, dollhouse-like garden shed. The whisper of woodwinds is present when the breeze ruffles feathery evergreens and draping branches. Cool jazz seems to emanate from the sophisticated outdoor living room at the base of the hillside. Not only does the garden make its own song, Ginny’s love of music ensures that anyone who steps into the garden is immediately enveloped by whatever recorded music she is playing that day. Four speakers, placed throughout the landscape, invite visitors to instantaneously make the connection that this is a garden not only for the eye but for the ear. The garden started small with the couple doing their own landscaping. 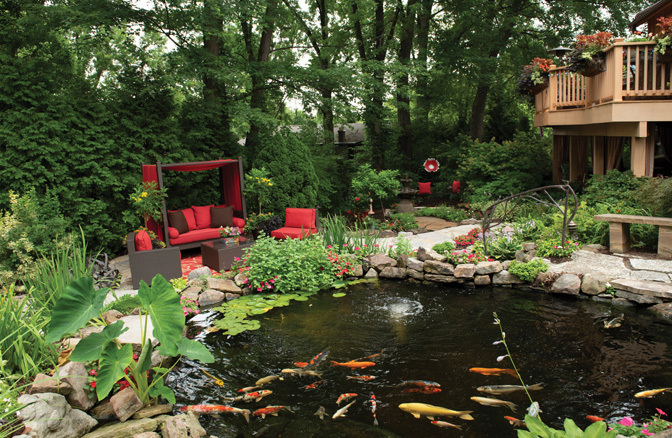 In time they added a small pond and “gardened around it. 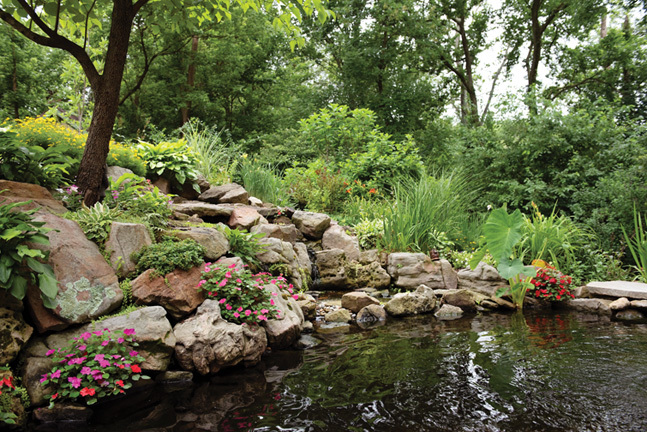 Then, we expanded it and we expanded it again,” she recounts, calling in Land Works to do the literal heavy lifting of creating and expanding streams and ponds. 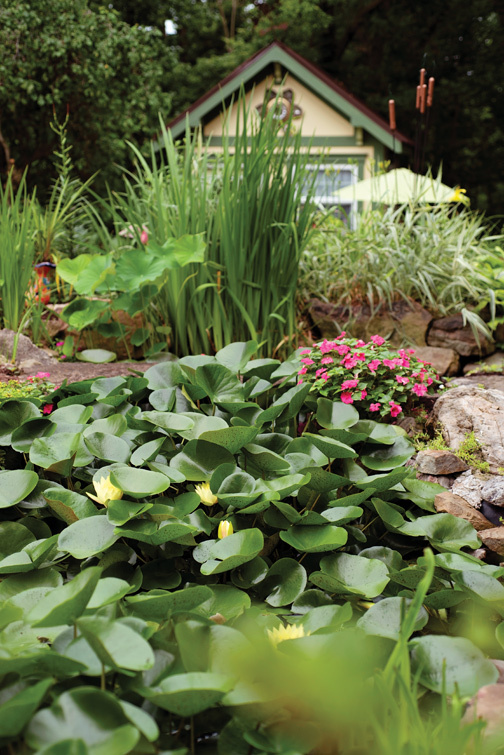 More recently, Caleb and Josh Bauer of Bauer Falls help tweak and maintain the project, which now consists of an upper bog pond filled with waterlilies and a lower koi pond. Two streams flow down the hillside and a natural stone bridge links both ponds. The garden now covers nearly an acre, according to Ginny, who has continued to maintain it following Ray’s death in a tragic road accident in 2010. Ginny credits the music of the garden with helping her get through the terrible period in the immediate aftermath of Ray’s death. 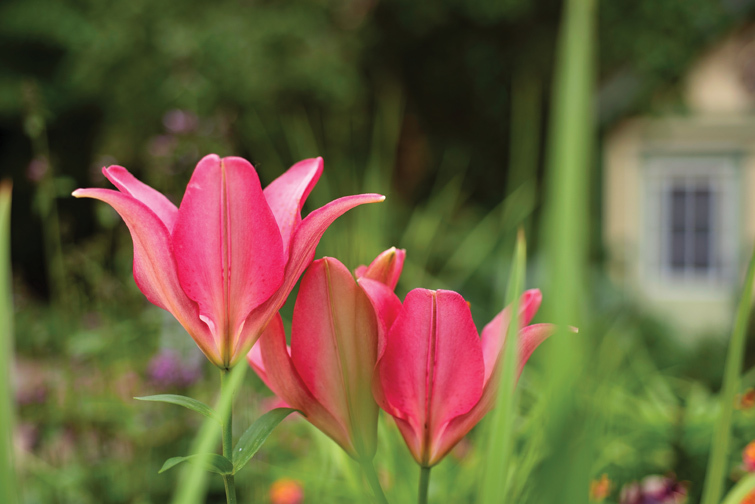 While Ginny’s love of music is a dominant theme in her garden, her love of color strikes an important note. 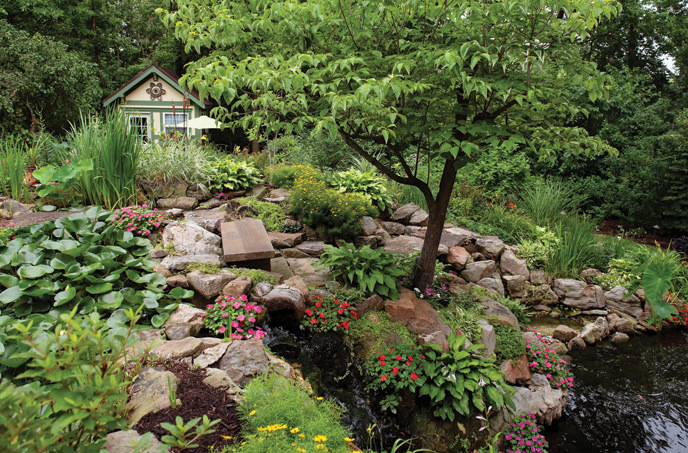 Her choice of flowering shrubs, perennials, vivid annuals and outdoor ornaments celebrates the feast for the senses that encompasses her orchestrated hillside. 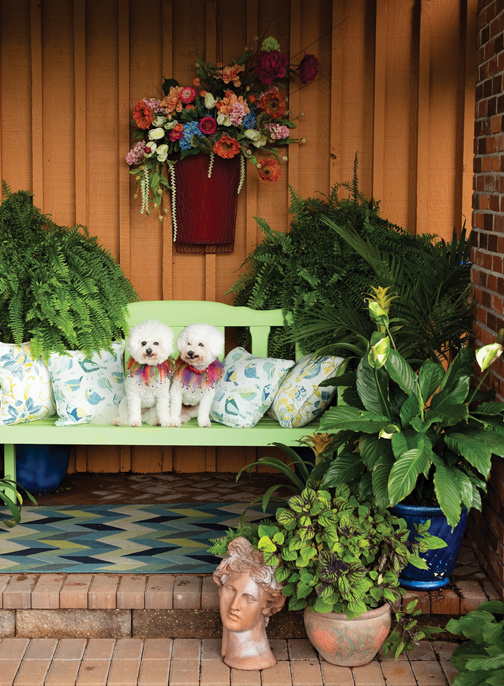 “I love color in my house, I love color in my clothes and I love color in my garden,” she affirms. Her third love, plants, ensures her garden is never static. 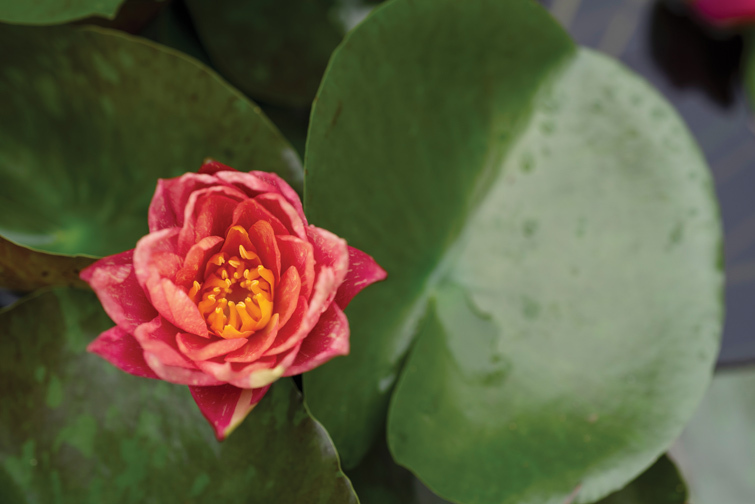 "I love going to garden centers, finding something new and looking for a place to plant it,” she says. 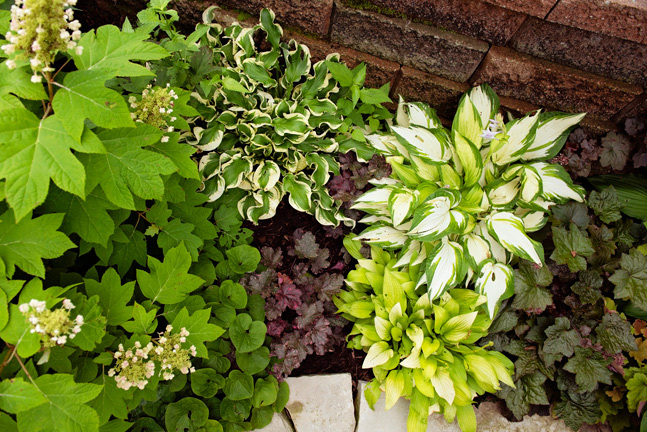 As much of her garden is in shade, hydrangeas, hostas, astilbies and ferns, some from Ray’s Aunt Tillie’s garden in Litchfield, IL, are favorites.